Strike it rich with a game of Texan Tycoon slots sometimes referred to as the "Texas Tycoon Slots" . It is a five reel and twenty-five payline game offering players a chance at a randomly awarded progressive jackpot, a free spins bonus round, the use of scatter, wild and multiplier icons and more! Coin values vary from one penny to five dollars apiece making this an ideal choice for the high risk wagers as well as the super-conservative players. The random progressive jackpot can be won by any player at the end or during their active gaming session. 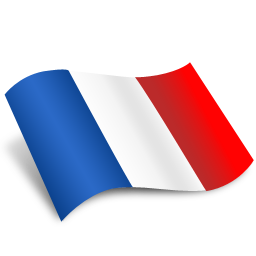 Although this prize is more likely to go to those players staking the larger bets on each of their spins, it can also go to any player at any time as well. The oil tycoon theme for the game is well-illustrated through the use of such symbols as the tycoon, oil well, piles of money, oil truck, oil worker, oil barrel and the A, K, Q, J, 10 and 9 images also. The wild symbol for the “Texan Tycoon” slots game is the tycoon himself and he will substitute himself for any other symbol except the scatter as a way of completing winning combinations along the active payline. This symbol is limited to reel three, and it must strike the payline to qualify, but when it does the player will see their winnings multiplied by two, three, five or ten times accordingly. The scatter symbol for the game is the oil well and it will also complete winning combinations when it appears on the reels at least or two or more times. The winnings for a scatter vary by the number of symbols appearing, and with five the player can multiply their original wager by two hundred times, with four it is twenty times, and with three it is by two times. Three or more scatters will trigger the free spins bonus round which gives the player up to twenty-five free spins during which time all winnings are tripled in value. 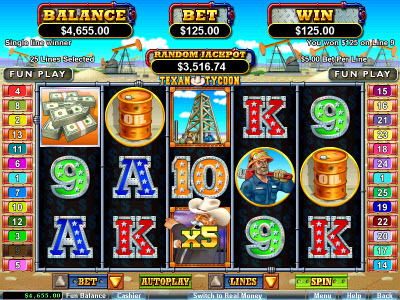 The prize payouts for the “Texan Tycoon” slots game depend entirely on the number of matching symbols striking the payline. When it is five the rewards are fifteen thousand coins in the amount wagered for the money, ten thousand for the truck, seventy-five hundred coins for the oil worker, five thousand for the oil barrel, twenty-five hundred for the Ace, King, or Queen, and one thousand for the Jack, 10 or the 9. When it is four symbols along the payline the prizes are five thousand coins for the money, two thousand for the truck, fifteen hundred coins for the oil worker, five hundred for the oil barrel, two hundred fifty for the Ace, King, or Queen, and one hundred fifty for the Jack, 10 or the 9. Three symbols falling on a payline will provide five hundred coins for the money, two hundred for the truck, one hundred fifty coins for the oil worker, one hundred for the oil barrel, and fifty for the Ace, King, Queen, Jack, 10 or the 9. When it is only two symbols appearing, the prizes are limited to five coins for the money, three coins for the truck, and two coins for the worker or the barrel.